Here's the thing about Call of Duty: Infinite Warfare. The game has something to prove. People were soured on the first trailer, which didn't have any of that authentic, grounded warfare we've come to expect from the series. While Activision and Infinity Ward tried to change that impression with an E3 theater experience, I wonder if it did much good. The footage Activision showed at E3 covered two levels of Call of Duty: Infinite Warfare. The first was set in Geneva, Switzerland. Sol Ares is invading, as it knows that's the UNSA headquarters. The whole point of the mission we saw was to retake a tower on the map after an invasion, then follow Sol Ares' forces up into space. Captain Nick Reyes, aided by fellow soldiers Ethan, Salter, and Raines, fight back against the invasion. The moment the footage began, Sol Ares blasted the area with this cloud of damaging black fog that rolled over everything. As Reyes was proceeding through the map, it was gradually dissipating. The team had to move gingerly, due to the disruption, and take caution due to the high number of civilians. 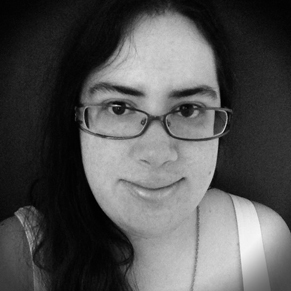 Once the tower neared, robotic forces abounded. Futuristic guns were deployed. An explosive robot-spider buddy headed out to attack enemies. Reyes was even able to hack into a robot on board a ship, see through its eyes, cause it to self destruct, and take down the transport as it did. Just when it started to feel familiar despite the futuristic trappings, Call of Duty: Infinite Warfare blasted off. Reyes and his team headed into space for an on-rails fight where they'd attack the enemy ships from above. Which, oddly enough, looked like naval aircraft carriers. Yes. Flying naval aircraft carriers. 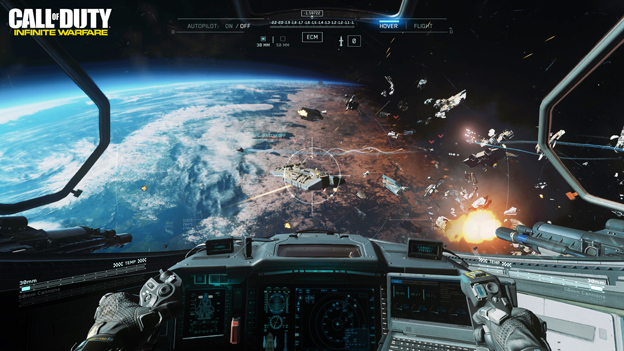 The second part of the Call of Duty: Infinite Warfare theater experience looked at another level called Ship Assault. This was an off-rails dogfighting level, which saw Reyes and his team landing on one of the aircraft carrier spaceships, rappelling from surface to surface with a grappling hook, busting into the ship's bridge, and taking it down from the inside. To be honest? The level footage reminded me of a grittier Star Fox Zero. You know Sector Alpha? Where you shoot the outside of the ship, then head inside to take it down? That's exactly what happened here. There were parts that were Call of Duty-like, when Reyes was going through Geneva on foot or invading the enemy ship, but then it would disconnect and switch to a science fiction focus. In contrast, Activision's E3 Call of Duty: Infinite Warfare presentation ended with a throwback. We were able to see the remastered version of Crew Expendable, Call of Duty: Modern Warfare's second campaign mission. It was more beautiful and engaging than I remembered. The fight to take over the ship, finding soldiers both ready and unaware. The rush to suddenly get off of a sinking ship and make it to the chopper. It was exhilarating. It felt real. It was authentic in a way the previous footage wasn't. 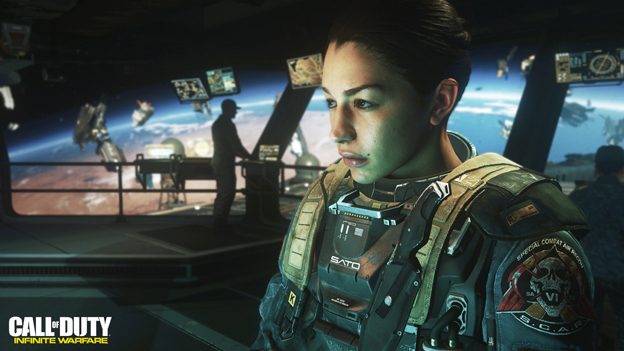 Call of Duty: Infinite Warfare's E3 footage isn't going to change people's minds about this entry in the series. It'll probably be even more divisive. While there are moments in Geneva that feel more familiar, the rest is just so surreal. It's very different from what we've come to expect from the series. We'll have to wait and see if the finished product has the feel we've come to expect from the series. 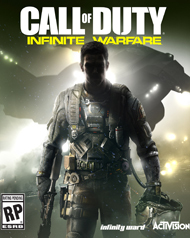 From what I've seen, it comes across more as a Call of Duty spin-off than a mainstream entry. I wish Activision had made it playable, so I could have known for sure. That it didn't, while EA did with Battlefield 1, left me feeling uncertain about this entry's future. Seeing it so starkly contrasted with the Modern Warfare Remastered title that we're bound to love was even more unsettling.